Venous thromboembolism (VTE) is the leading cause of morbidity and mortality among hospitalized patients. We searched the PubMed database and reviewed the articles published until June 2011. Articles related to the D-dimer and VTE were considered to write this paper. Many factors play a key role in changing the sensitivity and specificity of D-dimer testing, including the extent of thrombosis and fibrinolytic activity, duration of symptoms, anticoagulant therapy, comorbidity due to surgical or medical illnesses, inflammatory diseases, cancer, elderly age, pregnancy and the postpartum period, and previous VTE. Many previous studies have shown that the D-dimer test is highly sensitive (>95%) in acute deep venous thrombosis or pulmonary embolism, usually with a cut-off value of 500 μg FEU/l, which reasonably rules out acute VTE, particularly in patients with low clinical probability (LCP) or intermediate clinical probability. Patients with high D-dimer levels upon presentation may prompt a more intense diagnostic approach, irrespective of pretest probability. Studies performed after a negative D-dimer for 3 months proved the high negative predictive value (NPV) of D-dimer testing together with LCP in patients with suspected VTE. Among oncology patients, D-dimer testing has the highest sensitivity and NPV in excluding VTE. The new cutoff values of D-dimer testing were analyzed in a recent prospective study of pregnant women; they are 286 ng DDU/ml, 457 ng DDU/ml, and 644 ng DDU/ml for the first, second, and third trimesters, respectively. D-Dimer is used as an initial screening test in the emergency department to diagnose patients who have signs, or symptoms suggestive of venous thromboembolism (VTE). D-dimer is detectable in patients with deep venous thrombosis (DVT), as it is a marker of endogenous fibrinolysis. The purpose of this test, which has a high negative predictive value (NPV), is to provide a fast and cost-effective way to triage patients with thromboembolic phenomenon. Although the D-dimer has a high NPV, patients with positive D-dimer should undergo further imaging to determine whether or not they have VTE. We searched the PubMed database and reviewed the articles published until June 2011. Articles related to the d-dimer and VTE was taken into consideration to write this paper. This article discusses the epidemiology of VTE, clinical probability rules (CPRs), D-dimer levels and types of D-dimer assays, factors influencing D-dimer testing, the value of D-dimer testing in specific populations (including the elderly, pregnant women, and oncology patients), and lastly, the role of D-dimer testing in evaluating patients with recurrent VTE. In their retrospective study of 1161 patients, Lee and Zierler  made a statement about the under usage of the diagnostic strategy with CPRs and D-dimer as initial screening followed for suspected VTE. Similarly, another retrospective study noted that there was no documentation of pretest probability (PTP) assessment for 62 of the 97 documented VTE suspected cases. In this study, PTP assessment was not documented in the majority of emergency department cases of suspected VTE. Further, 25% of the documented decisions were in disagreement with established recommendations for a given test results, which were misinterpreted, applied incorrectly, or both. The D-dimer has been shown to be highly sensitive (>95%) in excluding acute VTE at the cutoff value of 500 μg FEU/l, at least in patients with LCP or ICP. In a study by Taira et al.,  the authors concluded that LCP patients with D-dimer levels <500 ng DDU/ml may not require additional and costly imaging studies. In the prospective study of 270 patients with suspected VTE, the HCP, ICP, and LCP in patients with suspected PE was 25%, 64%, and 11%, respectively. The HCP, ICP, and LCP in patients with suspected DVT was 59%, 32%, and 9%, respectively. In this study, the sensitivity of the D-dimer assay for ruling out VTE was 92% at a cut-off of <500 μg FEU/l, which did not reach the sensitivities observed in the other studies (>95%). Patients with HCP should not be tested for D-dimer because a concentration below the diagnostic cutoff is rare in this population and the posttest probability for a D-dimer >500 μg FEU/l has a poor positive predictive value for VTE. The low specificity of the test prevents it from ruling in the disease. Nevertheless, Bosson et al. suggested in a retrospective study that a D-dimer level above 2000 μg FEU/l was predictive of the presence of PE, with an odds ratio of 6.9, irrespective of clinical probability. The main drawback of this study was the high prevalence of PE, which was 27%, 58%, and 85% in the LCP, ICP, and HCP categories, respectively. The authors noted that these results require clinical validation in a prospective study. The significance of D-dimer in patients with HCP of PE was reported in a prospective study by Söderberg et al. D-dimer had a higher NPV than the Wells score, and the combination of both further improved the diagnostic algorithm. In the Christopher study, the false-negative rate of PE diagnosis by chest CT in patients with HCP was 5.3%. Similarly, in the PIOPED II (Prospective Investigation of Pulmonary Embolism Diagnosis II) trial of 7284 patients, 6 of 15 patients with HCP for PE and a negative CT had PE. In another retrospective study, there was a positive correlation between the prevalence of PE and the D-dimer level (7% at D-dimer levels of 0.5-1 μg FEU/ml and 90% at 9 μg FEU/ml). In a separate study of 44 patients, similar results were obtained for distal versus proximal DVT, detected by ultrasonography of the lower limb. In a study comparing the quantitative D-dimer levels to the presence of PE in symptomatic patients, PE prevalence was strongly related to the D-dimer level and increased 4 times with D-dimer levels >4000 ng FEU/ml compared with levels between 500 and 1000 ng FEU/ml. In a study performed in an out-patient setting in 671 patients with clinically suspected PE, the specificity of a D-dimer test was 93% when D-dimer levels exceeded 4000 μg FEU/l. However, in the presence of ICP and HCP, this resulted in a limited positive predictive value because of the relatively low PE incidence (20%). Thus, high D-dimer levels upon presentation may potentially prompt a more intense diagnostic approach, irrespective of PTP. The diagnostic yield of D-dimer is affected not only by the choice of assay, but also by patient characteristics. Certain factors influence the sensitivity and specificity in D-dimer testing, such as the extent of thrombosis and fibrinolytic activity, duration of symptoms, age, surgical procedures, anticoagulants, and comorbid conditions such as inflammatory states, cancer, pregnancy and the postpartum period, and previous VTE. D-dimer levels were positively correlated with thrombus extension, with high levels in the presence of larger thrombi. D-dimer levels had an inverse relation with duration between the onset of symptoms and testing, typically reaching 25% of the initial value after 1-2 weeks. In a study of 197 patients with positive D-dimer, the authors concluded that the presence of acute VTE could not be excluded if the D-dimer test were done after 1 week following the clinical presentation. Similar findings were noted by Speiser et al. (n = 39) and Heit et al. (n = 33) during their analyses. They concluded that the sensitivity of D-dimer was inversely correlated to the duration of symptoms. In a study by Wada et al.,  87 out of 754 patients had DVT, and the highest levels of D-dimer were seen on the 2 nd day of clinical presentation. D-dimer concentration was also affected by anticoagulation therapy and decreased approximately 25% by 24 h, with a consequent decrease in sensitivity from 95.5% to 89.4%. Individual factors, including patient age, renal function, and radiological chest abnormalities, were associated with false-positive D-dimer levels in 57%, 44%, and 70% of VTE-negative patients. Interestingly, D-dimer testing was falsely positive in 94% of VTE-negative patients with advanced age (60 years or older), renal failure, and abnormal chest radiology. A careful clinical assessment may be a more useful option for deciding further appropriate investigations in these specific patients, in order to reduce unnecessary exposure to radiation, intravenous contrast, and economic burden. D-dimer in renal failure reflects increased fibrin turnover apart from decreased elimination. , This group of patients has a relative risk of VTE of 2.1, which increases when the glomerular filtration rate reaches 75 ml/min/1.73 m 2 . D-dimer testing is of limited value in this group. The validity of D-dimer in oncology patients is compromised as its levels may be elevated even in the absence of thrombosis. The risk factors for VTE in oncology patients include location of primary tumor, stage and initial period after diagnosis of tumor, and associated comorbidities. Treatment modalities, including chemotherapy, antiangiogenic therapy, surgery, central venous catheters, and hospitalization, were other predisposing factors for thrombosis in these patients. Laboratory biomarkers that predict VTE are thrombocytosis or leukocytosis, tissue factor, soluble P-selectin, and D-dimer. In the prospective study involving 2263 consecutive patients with suspected DVT, independent poor prognostic factors were found for overall survival, including D-dimer levels >8000 ng FEU/ml and age >60 years. There were 247 patients (10.9%) with a known malignancy or who were diagnosed with malignancy during a follow-up period of 22 months. The elevated D-dimer levels in these patients were not due to the presence of thrombus and may reflect the biology of the underlying tumor. D-dimer levels >8000 ng FEU/ml were associated with an increased incidence of malignancy. A retrospective study by Lee et al. assessed D-dimer levels in 1068 patients with suspected DVT. The sensitivity of D-dimer was 86% and 83% in patients with and without cancer, respectively. However, the NPV was lower in oncology patients (79% vs. 96%). In contrast, in a study by ten Wolde et al.,  which evaluated 1739 patients with suspected DVT, the NPV for D-dimer testing was 97% in patients with and without cancer. Similarly, the NPV and sensitivity of D-dimer testing was high for diagnosing PE among oncology patients. Di Nisio et al. analyzed 2066 patients and found that the NPV for the test was 100% and 97% among cancer patients with LCP and ICP, respectively. Another study reported a highest sensitivity (100%; 95% CI, 82-100%) and NPV (100%; 95% CI, 72-100%) in a sample of 72 cancer patients. These data were confirmed in a second larger study, which involved a large cohort of 1721 outpatients. PE was ruled out by a negative D-dimer test in 494 out of 1554 (32%) patients without cancer, and in 18 out of 164 (11%) patients with a malignancy. The risk of VTE increases throughout pregnancy and is particularly high in the postpartum period, with an incidence of 1 per 1000 pregnancies. The utility of a whole-blood agglutination D-dimer test to exclude DVT in pregnancy has been evaluated in a prospective study of 149 pregnant women. It showed 100% sensitivity, 100% NPV, and a specificity of 60%, and highlighted that D-dimer measurements were helpful in excluding VTE in the first and second trimester of pregnancy (although its value in the third trimester was limited). In another study of 50 pregnant women, 50%, 22%, and 0% were in the reference range (0.5 mg FEU/l) during the first, second, and third trimesters, respectively. In another prospective study of 89 pregnant women, D-dimer testing had 100% sensitivity at the new cutoff values for the first, second, and third trimesters (286 ng DDU/ml, 457 ng DDU/ml, and 644 ng DDU/ml, respectively). In his study on 48 pregnant women, Morse  tried to establish a new reference range for D-dimer levels during pregnancy. The reference ranges were <465 ng DDU/ml and <640 ng DDU/ml for the second and third trimesters, respectively. Every effort should be made to implement the diagnostic strategies for VTE. The major limitation of D-dimer testing is its use in special clinical settings that result in low specificities, such as in oncology patients, elderly patients, and pregnant women. However, the test retains its high sensitivity and NPV in those situations. 1. Wells PS, Anderson DR, Rodger M, Forgie M, Kearon C, Dreyer J, et al. Evaluation of D-dimer in the diagnosis of suspected deep-vein thrombosis. N Engl J Med 2003;349: 1227-35. 2. Wells PS, Anderson DR, Bormanis J, Guy F, Mitchell M, Gray L, et al. Value of assessment of pretest probability of deep-vein thrombosis in clinical management. Lancet 1997;350:1795-8. 3. Wells PS, Anderson DR, Rodger M, Ginsberg JS, Kearon C, Gent M, et al. Derivation of a simple clinical model to categorize patients probability of pulmonary embolism: Increasing the models utility with the SimpliRED D-dimer. Thromb Haemost 2000;83:416-20. 4. Le Gal G, Righini M, Roy PM, Sanchez O, Aujesky D, Bounameaux H, et al. 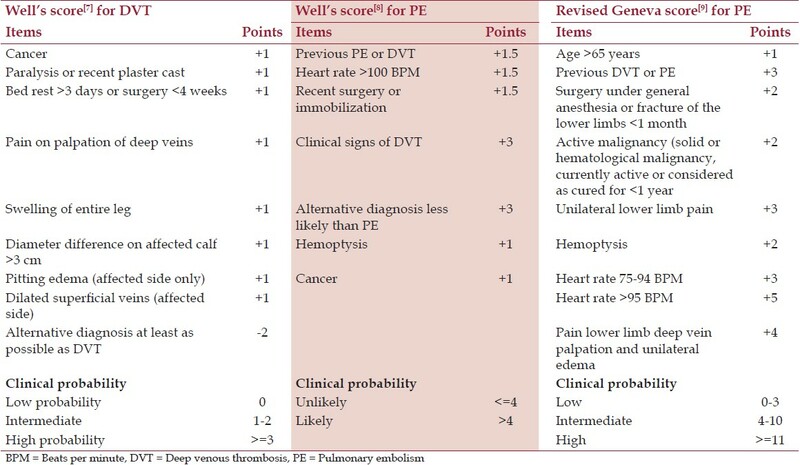 Prediction of pulmonary embolism in the emergency department: The revised Geneva score. Ann Intern Med 2006;144:165-71. 5. Douma RA, Mos IC, Erkens PM, Nizet TA, Durian MF, Hovens MM, et al. Performance of 4 clinical decision rules in the diagnostic management of acute pulmonary embolism: A prospective cohort study. Ann Intern Med 2011;154:709-18. 6. Runyon MS, Richman PB, Kline JA, Pulmonary Embolism Research Consortium Study Group. Emergency medicine practitioner knowledge and use of decision rules for the evaluation of patients with suspected pulmonary embolism: Variations by practice setting and training level. Acad Emerg Med 2007;14:53-7. 7. Roy PM, Meyer G, Vielle B, Le Gall C, Verschuren F, Carpentier F, et al. Appropriateness of diagnostic management and outcomes of suspected pulmonary embolism. Ann Intern Med 2006;144:157-64. 8. Lee JA, Zierler BK. The current state of practice in the diagnosis of venous thromboembolism at an academic medical center. Vasc Endovascular Surg 2011;45:22-7. 9. Smith C, Mensah A, Mal S, Worster A. Is pretest probability assessment on emergency department patients with suspected venous thromboembolism documented before SimpliRED D-dimer testing? CJEM 2008;10:519-23. 10. Prisco D, Grifoni E. The role of D-dimer testing in patients with suspected venous thromboembolism. Semin Thromb Hemost 2009;35:50-9. 11. Lippi G, Franchini M, Targher G, Favaloro EJ. Help me, Doctor! My D-dimer is raised. Ann Med 2008;40:594-605. 12. Stein PD, Hull RD, Patel KC, Olson RE, Ghali WA, Brant R, et al. D-dimer for the exclusion of acute venous thrombosis and pulmonary embolism: A systematic review. Ann Intern Med 2004;140:589-602. 13. Brown MD, Rowe BH, Reeves MJ, Bermingham JM, Goldhaber SZ. The accuracy of the enzyme-linked immunosorbent assay D-dimer test in the diagnosis of pulmonary embolism: A meta-analysis. Ann Emerg Med 2002;40:133-44. 14. Righini M, Perrier A, De Moerloose P, Bounameaux H. D-dimer for venous thromboembolism diagnosis: 20 years later. J Thromb Haemost 2008;6:1059-71. 15. Taira T, Taira BR, Carmen M, Chohan J, Singer AJ. Risk of venous thromboembolism in patients with borderline quantitative D-dimer levels. Am J Emerg Med 2010;28:450-3. 16. Lukaschek J, Schmid HR, Vorburger C, Beer JH. Critical appraisal of the diagnostics of 270 consecutive cases of suspected venous thromboembolism and established consequences at a non-university center. Swiss Med Wkly 2001;131:653-8. 17. Vanfleteren L, Wesseling G. Evaluation of the diagnostic yield of D-dimer testing in suspected venous thromboembolism in primary care: A 2-year retrospective analysis. Prim Care Respir J 2011;20:102-3. 18. Ljungqvist M, Söderberg M, Moritz P, Ahlgren A, Lärfars G. Evaluation of Wells score and repeated D-dimer in diagnosing venous thromboembolism. Eur J Intern Med 2008;19:285-8. 19. Anoop P, Chappell P, Kulkarni S, Shirley JA. Evaluation of an immunoturbidimetric D-dimer assay and pretest probability score for suspected venous thromboembolism in a district hospital setting. Hematology 2009;14:305-10. 20. Legnani C, Cini M, Scarvelis D, Toulon P, Wu JR, Palareti G. Multicenter evaluation of a new quantitative highly sensitive D-dimer assay, the Hemosil D-dimer HS 500, in patients with clinically suspected venous thromboembolism. Thromb Res 2010;125:398-401. 21. van Belle A, Büller HR, Huisman MV, Huisman PM, Kaasjager K, Kamphuisen PW, et al. Effectiveness of managing suspected pulmonary embolism using an algorithm combining clinical probability, D-dimer testing, and computed tomography. JAMA 2006;295:172-9. 22. Bounameaux H, Perrier A, Righini M. Diagnosis of venous thromboembolism: An update. Vasc Med 2010;15:399-406. 23. Bosson JL, Barro C, Satger B, Carpentier PH, Polack B, Pernod G. Quantitative high D-dimer value is predictive of pulmonary embolism occurrence independently of clinical score in a well-defined low risk factor population. J Thromb Haemost 2005;3:93-9. 24. Söderberg M, Brohult J, Jorfeldt L, Lärfars G. The use of D-dimer testing and Wells score in patients with high probability for acute pulmonary embolism. J Eval Clin Pract 2009;15:129-33. 25. Douma RA, Kamphuisen PW, Huisman MV, Büller HR, Christopher Study Investigators. False normal results on multidetector-row spiral computed tomography in patients with high clinical probability of pulmonary embolism. J Thromb Haemost 2008;6:1978-9. 26. Stein PD, Fowler SE, Goodman LR, Gottschalk A, Hales CA, Hull RD, et al. Multidetector computed tomography for acute pulmonary embolism. N Engl J Med 2006;354:2317-27. 27. Hochuli M, Duewell S, Frauchiger B. Quantitative d-dimer levels and the extent of venous thromboembolism in CT angiography and lower limb ultrasonography. Vasa 2007;36:267-74. 28. Tick LW, Nijkeuter M, Kramer MH, Hovens MM, Büller HR, Leebeek FW, et al. High D-dimer levels increase the likelihood of pulmonary embolism. J Intern Med 2008;264:195-200. 29. Perrier A, Desmarais S, Goehring C, de Moerloose P, Morabia A, Unger PF, et al. D-dimer testing for suspected pulmonary embolism in outpatients. Am J Respir Crit Care Med 1997;156:492-6. 30. Lee-Lewandrowski E, Nichols J, Van Cott E, Grisson R, Louissaint A, Benzer T, et al. Implementation of a rapid whole blood D-dimer test in the emergency department of an urban academic medical center: Impact on ED length of stay and ancillary test utilization. Am J Clin Pathol 2009;132:326-31. 31. de Moerloose P, Palareti G, Aguilar C, Legnani C, Reber G, Peetz D. A multicenter evaluation of a new quantitative highly sensitive D-dimer assay for exclusion of venous thromboembolism. Thromb Haemost 2008;100:505-12. 32. Kucher N, Kohler HP, Dornhöfer T, Wallmann D, Lämmle B. Accuracy of D-dimer/fibrinogen ratio to predict pulmonary embolism: A prospective diagnostic study. J Thromb Haemost 2003;1:708-13. 33. Perrier A, Roy PM, Sanchez O, Le Gal G, Meyer G, Gourdier AL, et al. Multidetector-row computed tomography in suspected pulmonary embolism. N Engl J Med 2005;352: 1760-8. 34. Di Nisio M, Squizzato A, Rutjes AW, Büller HR, Zwinderman AH, Bossuyt PM. Diagnostic accuracy of D-dimer test for exclusion of venous thromboembolism: A systematic review. J Thromb Haemost 2007;5:296-304. 35. Gibson NS, Sohne M, Gerdes VE, Nijkeuter M, Buller HR. The importance of clinical probability assessment in interpreting a normal d-dimer in patients with suspected pulmonary embolism. Chest 2008;134:789-93. 36. Righini M, Le Gal G, Aujesky D, Roy PM, Sanchez O, Verschuren F, et al. Diagnosis of pulmonary embolism by multidetector CT alone or combined with venous ultrasonography of the leg: A randomised non-inferiority trial. Lancet 2008;371:1343-52. 37. Siragusa S, Terulla V, Pirrelli S, Porta C, Falaschi F, Anastasio R, et al. A rapid D-dimer assay in patients presenting at the emergency room with suspected acute venous thrombosis: Accuracy and relation to clinical variables. Haematologica 2001;86:856-61. 38. D'Angelo A, D'Alessandro G, Tomassini L, Pittet JL, Dupuy G, Crippa L. Evaluation of a new rapid quantitative D-dimer assay in patients with clinically suspected deep vein thrombosis. Thromb Haemost 1996;75:412-6. 39. Goldin Y, Pasvolsky O, Rogowski O, Shapira I, Steinvil A, Halpern P, et al. The diagnostic yield of D-Dimer in relation to time from symptom onset in patients evaluated for venous thromboembolism in the emergency medicine department. J Thromb Thrombolysis 2011;31:1-5. 40. Speiser W, Mallek R, Koppensteiner R, Stümpflen A, Kapiotis S, Minar E, et al. D-dimer and TAT measurement in patients with deep venous thrombosis: Utility in diagnosis and judgement of anticoagulant treatment effectiveness. Thromb Haemost 1990;64:196-201. 41. Heit JA, Minor TA, Andrews JC, Larson DR, Li H, Nichols WL. Determinants of plasma fibrin D-dimer sensitivity for acute pulmonary embolism as defined by pulmonary angiography. Arch Pathol Lab Med 1999;123:235-40. 42. Wada H, Kobayashi T, Abe Y, Hatada T, Yamada N, Sudo A, et al. Elevated levels of soluble fibrin or D-dimer indicate high risk of thrombosis. J Thromb Haemost 2006;4:1253-8. 43. Couturaud F, Kearon C, Bates SM, Ginsberg JS. Decrease in sensitivity of D-dimer for acute venous thromboembolism after starting anticoagulant therapy. Blood Coagul Fibrinolysis 2002;13:241-6. 44. Qasim A, Duggan M, O'Connell N, O'Driscoll A. Clinical conditions and patient factors significantly influence diagnostic utility of D-dimer in venous thromboembolism. Blood Coagul Fibrinolysis 2009;20:244-7. 45. Gordge MP, Faint RW, Rylance PB, Ireland H, Lane DA, Neild GH. Plasma D dimer: A useful marker of fibrin breakdown in renal failure. Thromb Haemost 1989;61:522-5. 46. Wattanakit K, Cushman M, Stehman-Breen C, Heckbert SR, Folsom AR. Chronic kidney disease increases risk for venous thromboembolism. J Am Soc Nephrol 2008;19:135-40. 47. Righini M, Nendaz M, Le Gal G, Bounameaux H, Perrier A. Influence of age on the cost-effectiveness of diagnostic strategies for suspected pulmonary embolism. J Thromb Haemost 2007;5:1869-77. 48. Legnani C, Palareti G, Cosmi B, Cini M, Tosetto A, Tripodi A, et al. Different cut-off values of quantitative D-dimer methods to predict the risk of venous thromboembolism recurrence: A post-hoc analysis of the PROLONG study. Haematologica 2008;93:900-7. 49. Carrier M, Le Gal G, Bates SM, Anderson DR, Wells PS. D-dimer testing is useful to exclude deep vein thrombosis in elderly outpatients. J Thromb Haemost 2008;6:1072-6. 50. Khorana AA, Connolly GC. Assessing risk of venous thromboembolism in the patient with cancer. J Clin Oncol 2009;27:4839-47. 51. Knowlson L, Bacchu S, Paneesha S, McManus A, Randall K, Rose P. Elevated D-dimers are also a marker of underlying malignancy and increased mortality in the absence of venous thromboembolism. J Clin Pathol 2010;63:818-22. 52. Lee AY, Julian JA, Levine MN, Weitz JI, Kearon C, Wells PS, et al. Clinical utility of a rapid whole-blood D-dimer assay in patients with cancer who present with suspected acute deep venous thrombosis. Ann Intern Med 1999;131:417-23. 53. ten Wolde M, Kraaijenhagen RA, Prins MH, Büller HR. The clinical usefulness of D-dimer testing in cancer patients with suspected deep venous thrombosis. Arch Intern Med 2002;162:1880-4. 54. King V, Vaze AA, Moskowitz CS, Smith LJ, Ginsberg MS. D-dimer assay to exclude pulmonary embolism in high-risk oncologic population: Correlation with CT pulmonary angiography in an urgent care setting. Radiology 2008;247: 854-61. 55. Di Nisio M, Rutjes AW, Büller HR. Combined use of clinical pretest probability and D-dimer test in cancer patients with clinically suspected deep venous thrombosis. J Thromb Haemost 2006;4:52-7. 56. Di Nisio M, Sohne M, Kamphuisen PW, Büller HR. D-Dimer test in cancer patients with suspected acute pulmonary embolism. J Thromb Haemost 2005;3:1239-42. 57. Righini M, Le Gal G, De Lucia S, Roy PM, Meyer G, Aujesky D, et al. Clinical usefulness of D-dimer testing in cancer patients with suspected pulmonary embolism. Thromb Haemost 2006;95:715-9. 58. Cosmi B, Legnani C, Cini M, Guazzaloca G, Palareti G. The role of D-dimer and residual venous obstruction in recurrence of venous thromboembolism after anticoagulation withdrawal in cancer patients. Haematologica 2005;90:713-5. 59. Ginsberg JS, Brill-Edwards P, Burrows RF, Bona R, Prandoni P, Büller HR, et al. Venous thrombosis during pregnancy: Leg and trimester of presentation. Thromb Haemost 1992;67:519-20. 60. Chan WS, Chunilal S, Lee A, Crowther M, Rodger M, Ginsberg JS. A red blood cell agglutination D-dimer test to exclude deep venous thrombosis in pregnancy. Ann Intern Med 2007;147:165-70. 61. Kline JA, Williams GW, Hernandez-Nino J. D-dimer concentrations in normal pregnancy: New diagnostic thresholds are needed. Clin Chem 2005;51:825-9. 62. Kovac M, Mikovic Z, Rakicevic L, Srzentic S, Mandic V, Djordjevic V, et al. The use of D-dimer with new cutoff can be useful in diagnosis of venous thromboembolism in pregnancy. Eur J Obstet Gynecol Reprod Biol 2010;148:27-30. 63. Morse M. Establishing a normal range for D-dimer levels through pregnancy to aid in the diagnosis of pulmonary embolism and deep vein thrombosis. J Thromb Haemost 2004;2:1202-4. 64. Prandoni P, Noventa F, Ghirarduzzi A, Pengo V, Bernardi E, Pesavento R, et al. The risk of recurrent venous thromboembolism after discontinuing anticoagulation in patients with acute proximal deep vein thrombosis or pulmonary embolism. A prospective cohort study in 1,626 patients. Haematologica 2007;92:199-205. 65. Rathbun SW, Whitsett TL, Raskob GE. Negative D-dimer result to exclude recurrent deep venous thrombosis: A management trial. Ann Intern Med 2004;141:839-45. 66. Le Gal G, Righini M, Roy PM, Sanchez O, Aujesky D, Perrier A, et al. Value of D-dimer testing for the exclusion of pulmonary embolism in patients with previous venous thromboembolism. Arch Intern Med 2006;166:176-80. 67. Cosmi B, Palareti G. Update on the predictive value of D-dimer in patients with idiopathic venous thromboembolism. Thromb Res 2010;125 Suppl 2:S62-5. 68. Douketis J, Tosetto A, Marcucci M, Baglin T, Cushman M, Eichinger S, et al. Patient-level meta-analysis: Effect of measurement timing, threshold, and patient age on ability of D-dimer testing to assess recurrence risk after unprovoked venous thromboembolism. Ann Intern Med 2010;153: 523-31. 69. Eichinger S, Minar E, Bialonczyk C, Hirschl M, Quehenberger P, Schneider B, et al. D-dimer levels and risk of recurrent venous thromboembolism. JAMA 2003;290:1071-4. 70. Eichinger S, Heinze G, Jandeck LM, Kyrle PA. Risk assessment of recurrence in patients with unprovoked deep vein thrombosis or pulmonary embolism: The Vienna prediction model. Circulation 2010;121:1630-6. 71. Goldhaber SZ. Pulmonary embolism. N Engl J Med 1998;339:93-104. 72. Kline JA, Courtney DM, Than MP, Hogg K, Miller CD, Johnson CL, et al. Accuracy of very low pretest probability estimates for pulmonary embolism using the method of attribute matching compared with the Wells score. Acad Emerg Med 2010;17:133-41. 73. Büller HR, Agnelli G, Hull RD, Hyers TM, Prins MH, Raskob GE. Antithrombotic therapy for venous thromboembolic disease: The Seventh ACCP Conference on Antithrombotic and Thrombolytic Therapy. Chest 2004;126 3 Suppl:401S-28. 74. Prandoni P. Acquired risk factors for venous thromboembolism in medical patients. Hematology Am Soc Hematol Educ Program 2005;1:458-61.